More details have emerged of the contract arrangements beyond the end of this season, with Matteo Tosatto, Manuele Boaro and Wouter Mol (pictured) all agreeing to stay with their current teams. The Italians Tosatto and Boaro have extended for two more years with their Saxo Bank SunGard outfits, stating they are pleased with where they are currently competing. According to Riis, there was little thinking to be done when it came to keeping him on board. “It was an easy decision to renew Matteo's contract. Everybody on the team likes to work with him, his work ethic is outstanding, he has a lot of experience and, first and foremost, he has been good throughout the whole year.” He added that he felt he managed to be strong in the Classics and also in the Giro d’Italia and Tour de France, where he rode in support of Alberto Contador. 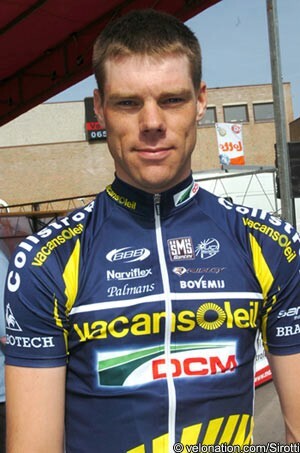 As for Mol, he is heading towards his fourth year with the Vacansoleil-DCM team and what will be his seventh under the guidance of Daan Luijkx. His best result to date was last year’s Tour of Qatar, where he won overall. This season has been a relatively quiet one for the 29 year old, although ninth in the GP Stad Zottegem and 14th in the GP Ouest France showed that his form was solid enough. He said that he has had a good chance to grow with the team and hoped to ride well after a good winter’s training. According to team manager Hilaire Van Der Schueren, he is important to the team not just for his performances, but also for how he helps guide the younger riders.